I’ve been intrigued by Anzac biscuits for some time, because of their somewhat romantic history and their position as the pseudo-national cookie of Australia and New Zealand, and also because the combination of oats and coconut is always appealing to me. 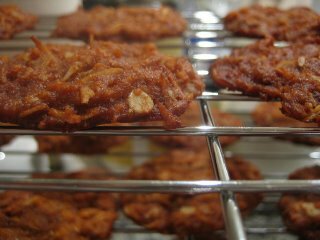 Despite the fascination in principle, I’d never actually tried one, so I decided to give it a go for this week’s Sunday cookie blogging. 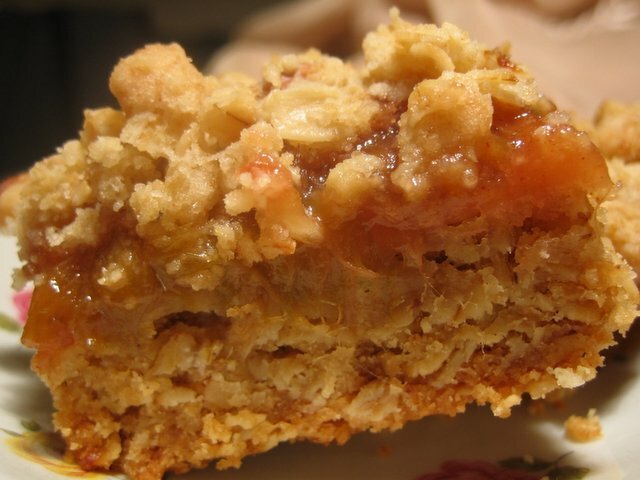 It was only after tracking down what seemed to be the most-cited recipe on the web that I realized I did not have any plain rolled oats left, after using them up on last week’s rhubarb bars. I did have a multigrain rolled cereal instead – comprising oats, wheat, rye, and barley – which His Lordship likes to have for breakfast on occasion. What the hell, I thought, and decided to give them a try. I also opted to add some ginger. The recipe was very quick to prepare and left a minimal mess in my kitchen, since you don’t use the mixer, making it a good candidate for Sunday-night baking. The cookies turned out rather darker brown than I’d expected, but are very crisp and pleasant-tasting. I’m not sure if you really notice the fact that it’s multigrain, but in this context, I think that’s probably a good thing. You might be able to sneak some whole grains into your kid’s diet this way. Next time, just to see if I can tell the difference, I think I’ll try it with plain oats, use light brown sugar instead of dark, leave out the ginger, and add macadamia nuts, based on one of the other variations I found on my Google trek. Combine the flour, cereal, coconut, sugar and ginger in a medium-sized bowl. In a Pyrex liquid measuring cup, melt the butter and Golden Syrup together in the microwave. Mix the baking soda with the water and add to the butter mixture, then pour the mixture into the dry ingredients and stir until combined. Scoop tablespoon-sized balls of dough onto the baking sheet, leaving two inches between cookies. Bake for 15 minutes, or until golden brown and firm. Cool completely on a wire rack, and store in an airtight container. In my ongoing valiant quest to present legitimately quick, easy, delicious and nutritious meals, here is what His Lordship and I had for dinner last night, courtesy of our Saturday trip to the farmer’s market, where the signs of spring are truly undeniable, as evidenced by the asparagus, radishes, baby greens, scallions, rhubarb, early tomatoes and fresh herbs we picked up. I also stopped by my favorite cheesemonger and picked up some of the lovely and sharp Canadian cheddar he recommended a while ago during a side-by-side tasting with several imports from the UK, during which the Canadian stuff beautifully held its own while costing half the price. By the time we’d gotten the goods home, we’d already decided to roast the asparagus, and I decided to combine it with the salad we’d also planned to have instead of serving it on the side. Because radishes can be peppery and a little bitter, His Lordship suggested a sweeter dressing, so I threw together a basic honey-mustard vinaigrette, which worked very well with all the components. 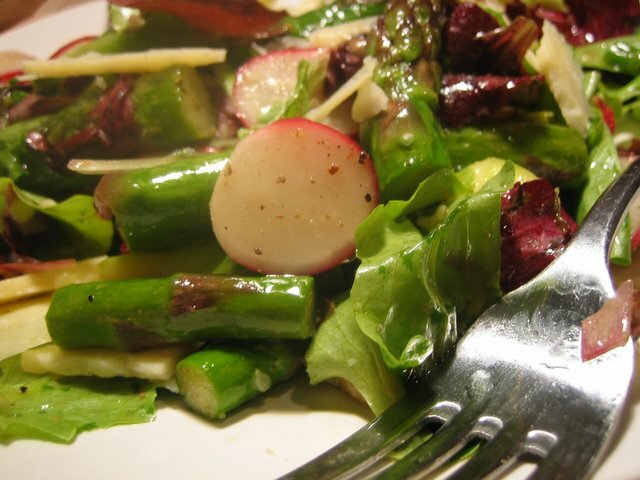 The cheese shavings on top were not only decorative but gave a nice sharp-but-smooth contrast to the sweetness of the asparagus and the dressing and the crispness of the radishes, to say nothing of adding some extra protein. This is a really delicious, satisfying, and pretty salad which would make a very nice first course as well as a light main course. Preheat oven to 425 F. Clean asparagus and use a vegetable peeler to peel away the tough and woody outer layer on the end of each stalk, or bend each stalk gently until the tough lower portion snaps off, saving those parts for soup. Toss the spears with the olive oil, salt and pepper, and lay in a single layer in oven-proof dish. Roast the asparagus uncovered for 15-20 minutes, or until easily pierced with a sharp knife, but not so long that it loses its bright green color and becomes mushy. Once the asparagus is cooked, remove from the oven and cut each stalk into two or three smaller segments. While the asparagus is roasting, combine the mustard, honey, salt and pepper in a bowl, stirring with a small whisk or a fork until thoroughly combined. Slowly add the olive oil in a thin stream, stirring briskly to emulsify. Once the oil has been incorporated, add the minced scallion and drizzle in the vinegar. In a large bowl, toss the greens, radishes, scallion tops and asparagus with salt and pepper, then add half the vinaigrette and toss, tasting to see if it’s sufficiently dressed. If not, add the remaining vinaigrette to taste and toss again. Divide the salad between plates, and sprinkle over the cheddar shavings before serving. Notes: Parmesan, gruyere, or another sharp and dry cheese should work equally well here. If you’re not a vegetarian, poached or roasted chicken or duck, or perhaps even pork, would be a good addition to round out the salad into a complete meal.